Usually, the All-Star Break marks the proverbial midpoint of a sports season, and with it, comes the perfect time to take stock of some of the biggest surprises – both good and not-so-good – as that season gets ready to start its second half. 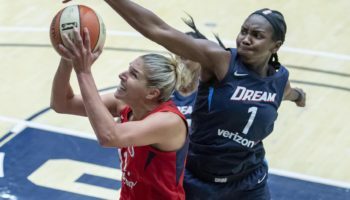 But, in this WNBA regular season, the All-Star Game, contested last weekend in Minneapolis, left all teams with only this final week in July and the first three weeks of August before the playoffs arrive. Regardless, the All-Star Break has come and gone and we, below, are our observations of the teams and performances of note during the “first half.” With only four games separating second place from ninth entering Friday’s action, teams on either side of the surprise/disappoint list could easily cross to the other side by the time the season ends. 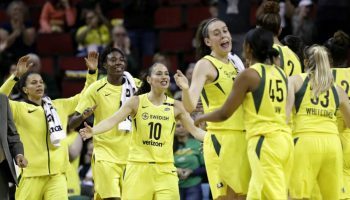 At this time last season, the Seattle Storm were not even on the radar as a Top-5 team in the league, as reported dissension between the team and erstwhile head coach Jenny Boucek was the headline story in a disappointing eight-place finish and a first-round elimination at the hands of the Phoenix Mercury. But now Seattle, under first-year head coach and two-time WNBA Coach of the Year Dan Hughes, is taking this season by storm (pun intended), winning 20 games (20-7) and well on pace to clinch the number one seed in the playoffs – all while threatening the duopoly that has emerged in the WNBA Finals between the Minnesota Lynx and Los Angeles Sparks the past two seasons. 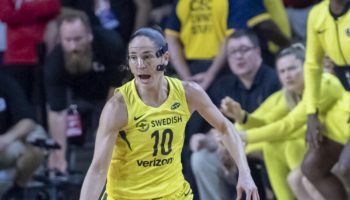 Forward Breanna Stewart has elevated her game to an even higher level, averaging just over 22 points per game, second in the league in scoring. Fellow UConn alum Sue Bird sure is playing like someone who should hold off that retirement talk for a long, long time, as she is second in the league in assists per game (7.2) while lapping the field in assist-to-turnover ratio (4:1). The Atlanta Dream continue to make noise this season after missing the playoffs the past two seasons. Guard Tiffany Hayes has been clutch all season, with her buzzer-beating half court shot on July 17 in Connecticut one of the plays of the season. 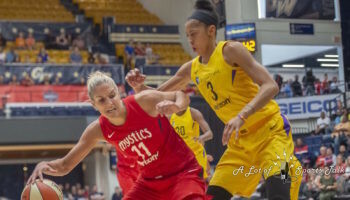 Hayes was named WNBA Eastern Conference Player of the Month for July, averaging 17.6 points, shooting 50.7 percent from the field and 38.5 percent from the three-point line game as the Dream ended up with a 9-2 in the month. Oh, and there’s the return of Angel McCoughtry, after her year off in 2017 to rest her mind and body, in helping the Dream occupy the No. 2 spot at the moment. 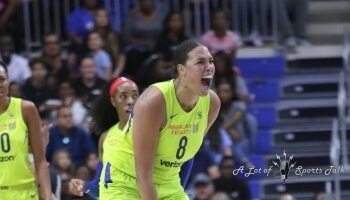 Though her undeniable talent would make one think Dallas Wings center Liz Cambage could dominate the league one day down the road, it may be a little surprising that her dominance has already arrived. In her first season back in the WNBA since 2013 after playing the last five seasons in China and in her native Australia, Cambage is on a tear the league has never seen before. For starters, she made history on July 17th against the New York Liberty, setting the single-game record of 53 points, while also grabbing 10 boards and blocking five shots. She followed that up in her next game against the Washington Mystics with 35 points, 17 rebounds and four assists in a home win. Over her last six games, Cambage has scored 206 points, the most any player has scored over a six-game span in league history. Cambage’s play, along with that of point guard Skylar Diggins-Smith, has led the Wings to lead the league in offensive efficiency, making this team far from an easy out if it makes it into the postseason. We can’t forget about the WNBA’s best trio in Phoenix. Diana Taurasi, Brittney Griner, and DeWanna Bonner combine for over 55 points a game, as the Mercury remain with a good chance to finish the season as high as No. 2 in the league going into the postseason. Don’t forget that this trio has a championship pedigree as they won the 2014 WNBA championship together, the last league title not won by the Sparks or the Lynx. At this time last season, the New York Liberty were still in the hunt for a top-two seed, eventually finishing with a 22-12 regular season and the No. 3 spot in the playoffs. This season, they are now hoping they do not finish the season with 22 losses. This is unfamiliar territory for the Liberty, as the team has only missed the playoffs six times since the franchise (and league) began in 1997. For the past three seasons, the Liberty’s record has been over .500, winning at least 20 games each season. All of those recent seasons were under head coach Bill Laimbeer, who left the team after their playoff home loss to Washington at the end of last season to lead the expansion Las Vegas Aces in year one. This is Katie Smith’s first year as head coach, and the Liberty are headed for only their fourth 20-loss season in franchise history. For the past two seasons the Indiana Fever are continuing down a slippery slope, a far cry from their stretch between 2009 and 2015, when they made three WNBA Finals in that seven-year span and won the championship 2012 over the Minnesota Lynx. Last season saw the Fever win just nine games and, so far this season, Indiana finds itself 3-23, getting off to the worst possible start in losing their first 10 games before getting in the win column. Indiana was the first team to be eliminated from playoff contention, so the rest of the campaign will be an exercise in playing for pride and to keep their positions going into 2019.